As you know, we announced the new Classic Sewing magazine last month, and the results have been phenomenal. Now, I am excited to reveal the cover of our premier issue. Do you recognize our little star? That’s right, it’s my granddaughter Amelia. And it was so special to share the creation of this magazine with her. As much as sewists will look forward to this exciting sneak peek, they’re truly rejoicing that we will have a luxury sewing magazine with the industry’s best editorial director, Kathy McMakin, at the helm. Kathy has been in the sewing industry for more than 30 years. She is recognized as the leading expert in education and innovation in the sewing industry. She started her needlework career at the Martha Pullen Company in 1981, where she worked alongside Martha Pullen in launching and developing the heirloom sewing industry. 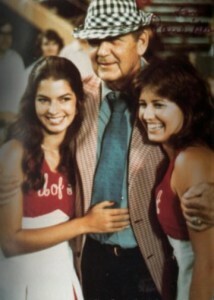 Kathy McMakin on the right with famed University of Alabama football coach Bear Bryant and fellow cheerleader, actress Sela Ward. The University of Alabama is Kathy’s alma mater and where she was one of the Alabama cheerleaders during the reign of Bear Bryant. She met her husband, David McMakin, a star football player at Alabama, and the rest is history. They have two children and three grandchildren. Kathy is a master sewist. She is known for her ability to motivate and educate sewists internationally through the curriculum and other programs she has authored. Her students love her sense of humor and her witty smile. She will lead the Classic Sewing team here at Hoffman Media with the magazine development and expansion programs into the sewing industry. Her vision and creativity will make the magazine the best in the industry. To know her is to love her, and you will enjoy seeing beautiful examples of her work here on The Ribbon In My Journal. Kathy inspired me to expand my sewing skills years ago and for that I am thankful. Soooooo happy for you , my dear . All the best !! I should get busy and make something for your magazine . God bless you with your endeavors. Love , Suri. I am really ready for new insirational materials. There has been a void in this world since Martha Pullen left her magazine. Kathy Mcmakin is the very best and perfect model for this new venture and I am thrilled to see not only the new magazine Classic Sewing but Kathy McMakin! I am very happy for you and look forward to the magazine. I had a big gap in my life since the end of Sew Beautiful. Thank you! Amelia is precious and perfect for this first cover. I am so looking forward to this beautiful new magazine! The dress on your granddaughter was just beautiful! My mother was such a wonderful seamstress and she could do everything! My daughter wore dresses just like your granddaughter’s! I sew, but only basic sewing techniques. I would love to learn more but now, with your new sewing magazine, I think it would be possible! I am looking so forward to it! I bought a sewing machine years ago with every intention of learning to sew simple craft projects, etc., however, I’m ashamed to admit, I’ve yet to pull it from its’ case. Two years ago, my daughters purchased a monogramming machine for me for Christmas and I’m presently taking steps to learn this incredible new machine. The introduction of this magazine has piqued my interest in learning to sew once again so I think I’ll subscribe and finally pull that sewing machine from it’s case. Please, for subscribers who are new to this craft, please make sure to include “simple sewing projects” for beginners like me. Thanks, once again, for presenting your readers with such quality publications that encourage such beauty and creativity. Ms Phyllis, huge hugs from my heart to yours! Your granddaughter is precious! And yes this is the way little girls should be dressed! I do not know how to sew, but I’am always intrigued with sewing, monograming, stitching etc…. In past years I have done needlepoint but not recently… Maybe this magazine will inspire me to get acquainted once again! Thank you once again Phyllis! Phyllis, I am so glad you volunteered your lovely grand daughter for the magazine cover. She was perfect for it and the magazine sounds as if it will be another winner for your house. So many small children are dressed in little copies of adult clothes these days that the photographs of her were like a sweet breeze from the past. Unfortunately I never did well in sewing and tried numerous times. My mother made many of the clothes I designed while in Art classes at Ramsay High School. She created muslin patterns from my drawings. Knowing that you are wearing beautiful, lovingly made, one-of-a-kind dresses, skirts, blouses, and especially the long, black velvet evening cape with a large white satin-lined, stand-up collar for dances was a joy. Kudos to you, Kathy and all the other ladies who ply this ancient art so enthusiastically, and to Amelia for modeling so fetchingly. Your granddaughter is perfect!! How lovely she is and the dress …. Beautiful!!!! How I envy…. In a good way…. Your ability to sew like you do. Thank you, as always, for sharing your special pictures and amazing magazines. Kathy, I remember the photo of the “Bear” with you and Sela Ward from my UA days! I am excited about the new magazine, as I was a subscriber to Sew Beautiful for years. Charming granddaughter! Love her dress. Look forward to the magazine, as I look forward to everything by Hoffman Media. I love smocking and hand embroidery. However, in years past, I have had subscriptions to lovely sewing magazines, which included patterns for beautiful handwork, but my only complaint has been that all of the patterns and designs have been for children. I just do not need those, and would like to see more pretty things in the way of adult clothing and household linens. YES! I love that request! Phyllis do you know of any good embroidery kits? All I have found in Knoxville Tn is crewel, and cross stitch. I have not came across candle wicking patterns in nearly thirty years. I miss my needle work. Any leads? Haus Tyrol in Williamsburg carries all kinds of kits. Try there. I have purchased many things from them, but mine have been crewel or cross stitch. Your granddaughter is beautiful! How special to have her on the first issue’s cover. I took a beginning heirloom class of Kathy’s and was delighted with the outcome of my project…because of Kathy’s teaching skills! Since then, I have purchased her DVDs and learned even more from her right in the comfort of my home. I wish the very best success for your magazine, can’t wait for this first issue to arrive in my mailbox!!! Thank you so much. Your encouragement means so much to us! “I’m Hungry”, “Feed Me”, and Bon Apetite”, all the ladies love Mom’s bib because it’s personalized and they all remember her name as they struggle with dementia and Alzheimer. They repeat her name throughout the day but not each other. Makes my Mom feel special. Thank you! !1 That is a lovely story. What a beautiful granddaughter!!! She is perfect for the premier cover. I never learned to like to sew; I needlepoint instead. However, my mother was an expert seamstress and one of my fondest memories of her is her lovingly making a plaid, first day of school dress for my sister and me, and it usually had a large lace or pique white collar. I loved those dresses! I do not sew, but I have a deep appreciation for the work of those that do enjoy sewing. Just with needlepoint, I know how many hours of work go into a needle work endeavor, whether it be sewing or any other form of needle work. Best wishes on the launch of your new magazine!!! Now, it you would create one for needlepoint, I would be ecstatic!! Beautiful child! I haven’t done any sewing for years (since I had three grandsons who quickly outgrew the desire to wear smocking). Martha Pullen was my constant inspiration when my (now adult) daughters were growing up. I’ll have to buy the magazine just to reminisce. Thank you for all your lovely magazines. They always inspire me to be better. Knowing Kathy and Phyllis makes me secure in the knowledge that this will be fabulous. Both love sewing, people, creativity and beautiful, joyful things. The quote above gives me IMMENSE hope for the future of sewing, the connections it enables, the hospitality it brings with some of the most intelligent, accomplished, genuine women I have ever met. Now that is a run on sentence worthy of the grammar police. My heart sings. Run on sentences are always wonderful. Thank you!!! Kathy is amazing. She is just beautiful. And the dress, the color and fabric are all exquisite. Oh if I could sew like that! Mmmm..
What a beautiful granddaughter and the perfect cover, and love the introduction to Kathy! Happy Thursday, Phyllis! By all gods, PLEASE leave the way it is now as an option, something. Anything new you seem to add or change here is absolutely HOELBIRR.If you really want to bother making YouTube worse (like you guys seem good at, and you are pros at bad decisions), at least let the people decide what looks best, because you clearly can't do that for us. You know I love the buffets. Now I can be low carb at buffets and even have room to live my sweet life. Low Carb Master, I think you’re awesome. How happy she is to try to hang someone…but now it’s HER turn to hang for being so BIG. We paid to educate her nieces and nephews…now lets give her the bill…and her walking papers! Scum..she is pure scum. This magazine looks so beautiful! And Amelia? Adorable…she is the perfect model for these beautiful dresses Phyllis. I just know Classic Sewing is going to be a huge success. Thank you for giving us an introduction to Kathy. I was a Home Economist with good sewing skills until I had a stroke in my 30’s. I could not sew anymore. My mom dragged me to a Martha Pullen School of Art Fashion (I cried through most of it) and Kathy and Martha and Pam Mashie and Missy Billingsley helped get me sewing again- but especially Kathy. She has such a gift of being able to reach just about anyone! Sewing is still difficult for me- every time I make something it is like doing it for the first time all over again. Kathy helped to give me my dream back. I may never sew as well as I used to- but I have learned the joy is in the journey. 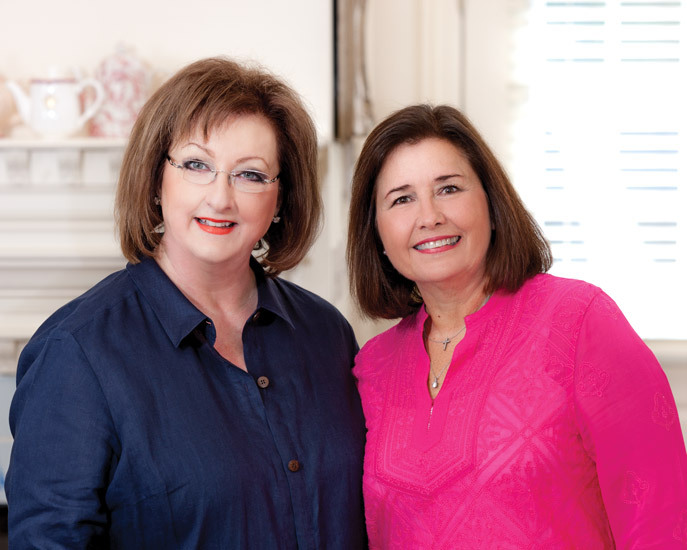 We at Southwestern Baptist Theological Seminary in Fort Worth, TX, have one of the few genuine homemaking concentrations available to young women on baccalaureate and master’s level through our Horner Hormemaking House. I have already subscribed to this wonderful resource to inspire and mentor the women in our programs! Kathy would love our beautiful and spacious textile room with cutting station and fold-out ironing boards on every corner, state of the art sewing machines and monogram equipment as well as hemming platform. Would love to know if you personally made her dress. What a beautiful grandchild you have! thank you. I volunteered her to do this!! !